vocalist + producer Sam Setton fuses his moody electro-R&B style with pop melodies in his latest track Gum, a single all about falling in love. On the title, Setton writes that the feelings of first falling in love can be ‘so amazing but also fleeting,’ like ‘the burst of flavor when you first chew a piece of gum.’ We chatted with Sam about the emotive track + what’s next. Sam Setton: Thank you! 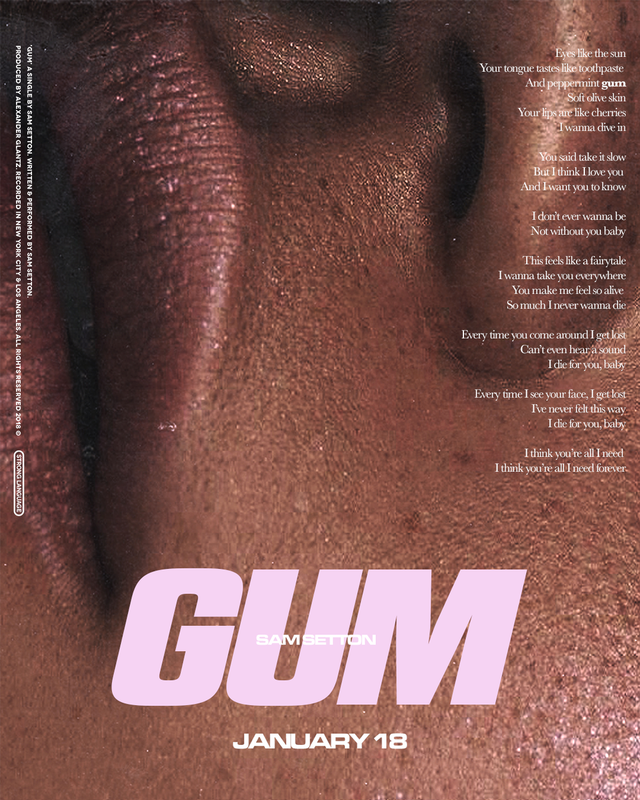 Gum is about the feeling of falling in love for the first time. It’s one of my favorite tracks I’ve ever written, and it’s my first release of 2019, so I’m super excited! AM: For first time listeners, how would you describe your sound? SS: I like to call it ‘moody pop’. I describe it as something like ‘sensual vocals over electronic infused production’. AM: Do you have certain themes that you typically pursue through your music? SS: For the most part I’d say it’s themes of heartbreak, love and self discovery. AM: What do you think is the hardest part about writing/making music? SS: For me personally, it would have to be executing on my initial vision and expectation for the song. The actual writing process comes easy, but putting it all together to create the right feel with production and vocal intensity—that’s the hardest. AM: Where is one place that you feel completely in touch with your creative self and your music? SS: Hmm great question. Either in my bedroom or walking around the streets of downtown NYC at night. AM: What other musicians are currently inspiring you? SS: I’m always inspired by the artists that are in my heavy rotation. Right now, that’s a group from the UK named Petrie + Bad Bunny, GASHI and A.CHAL. SS: A lot of new music! I’ve been working on a lot of new tracks that are like nothing you’ve ever heard before, but with that Sam Setton sound. 2019 will be a year full of new music from me. // Listen to more Sam Setton on Spotify + SoundCloud.